This week Katie challenges us to use Stripes, polka dots or both on your Christmas card. I chose to use both stripes and polka dots. I love this ornament & Sentiment from Simon Says Stamp. It is from their latest release for Stamptember. Who doesn't love a little pink and silver for a Christmas card?! Have you started on your holiday cards yet? Christmas will be here before you know it. 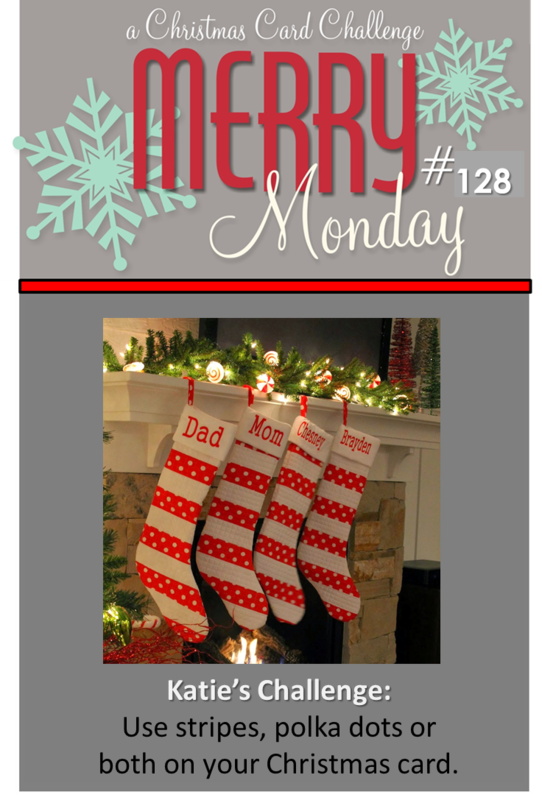 Make sure you check out the other DT members cards over at the Merry Monday challenge blog. I've about 40% there on having my cards complete. A ways to go because I think I mail too many but I love it! The pink/gray combination and the score lines are fabulous Kristie. I love how you were inspired. This is very pretty! Love that shining silver ornament! Love the pink and silver!! Love this clean and simple design ! I love that you chose pink and silver for your card, Kristie! Your ornament is so pretty, and I love how you played with the stripes and polka dots! Gorgeous card! The pink polka dots are so pretty with the elegant silver ornament, Kristie! Love how you scored the stripes! Have some fun this week! Kristie, I just LOVE that silver ornament and love the pink! Hope you have a super week! The pink and the silver embossing are tres chic! Love this! Fantastic ornament image, and I love the pink and silver together. Oh wow! The pink and silver look so good together! Love this card! Love the combo Kristie! Quite creative on the striped part. :) I have to admit, I'm not a pink girl - but the silver/pink combo does look pretty cool! Wouldn't be the first time you've converted me to something...lol. Sweet and simple, Kristie and that silver ornament is divine! This card has two of my favorite things for cards...PINK! My favorite color, and polka dots really like to see and use polka dots on cards...This is so pretty! Like this challenge. Hope I find time to play this week. Fantastic card Kristie, I love pink and silver together and this is a great layout. This is so so pretty...love pink on Christmas cards. Polka dots and stripes....gotta love 'em! These two elements were made for each other! Gorgeous pink & silver....soft, pretty, fun and whimsical! And yes, this ornament die is fabulous and is now on my 7,000 page wishlist of "Stuff I Think I Need". ....have I started my Christmas cards? They are merely visions dancing in my head! Great clean & simple card and the ornament is so pretty!